Father and son had a conversation the other day. "Have you heard of Tiger Woods?" "Do you know how Golf course looks like?" "Do you want to play golf "
In just 3 words, I express my interest in golf. Surprised by my enthusiastic response, Daddy gladly accepted the invitation of my golf Kaki Academy for a 2 hours long golf clinic conducted on a Saturday afternoon. We arrived at 4pm and was greeted with a hot blazing sun. Luckily for us, my golf Khaki had provided us some cool golf caps to protect our heads. Without any prompting , I headed to the 'greens ' and picked up a 'golf stick' and started playing... Except that I was told I had picked up a raking stick and am in the sand pit instead of the greens. my golf kaki academy is a part of NCI golf that owns Marina Bay Golf course. It is located at Tanglin Golf Course. 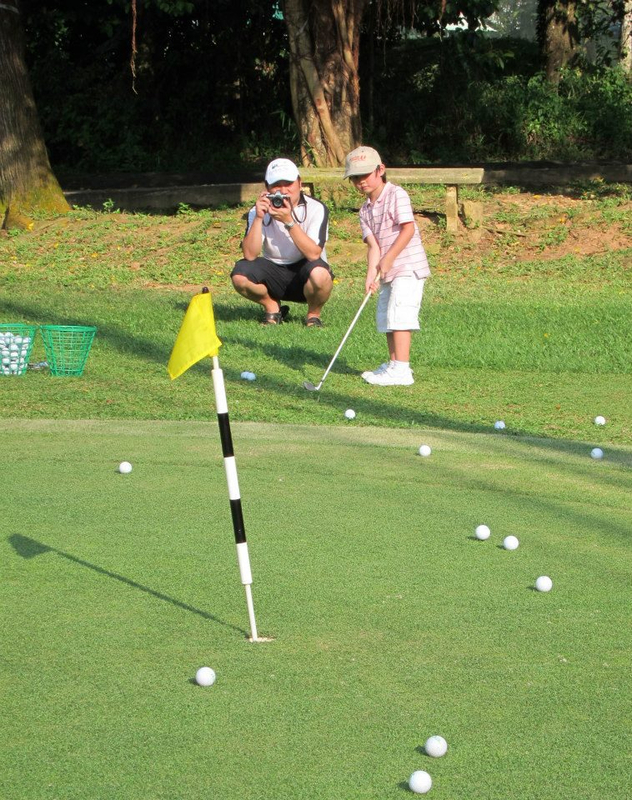 The venue at Tanglin consist of a mini driving range, chip and putt practise green as well as a 6 hole course opened to public for practise and competition ( green fee applies.my golf kaki academy provides a range of courses for the public. They range from beginner, intermediate and youth development. For more details , do refer here. After the earlier boo boo , we gathered with pals from Sengkang Babies and Edunloaded to learn what golf really is in this golf appreciation clinic. The clinic is designed to introduce golf to beginners like me. It is a 2 hour long clinic for holders and non golfers alike. We were taught the fundamentals of golf as well as the technical and social aspects of the game like safety and sportsmanship. Our coaches for the day are pros Jay and Gabriel. We started off with safety briefing and grip, posture and alignment course. We were introduced to the different types of grips such as the baseball and interlock grip. As this part of the lesson was technical ( I.e. a lot of talking) , the younger group got lost and a little restless . After a gruelling 20 minutes of staring into space, we are ready to hit out first balls. Daddy actually enjoyed the session as it allows him to refresh his basic on holds and stance. He had not touch a golf ball for over 5 years. He is a little rusty and out of shape old and thus he finds the lecture lesson on the basics very useful. As for little kids like us, we would rather let our golf clubs do the talking. 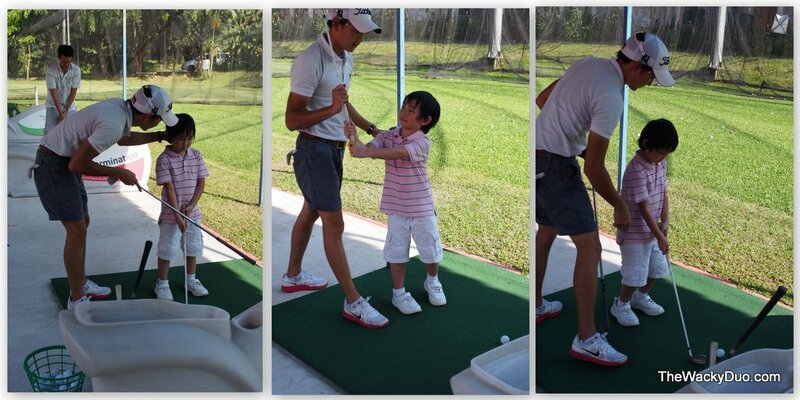 It's a good thing too that my golf kaki academy provides kids size clubs for our training. Adult size clubs will be a tad too big and heavy for us to control. After some one to one coaching from Gabriel, the instructor for the day, I was ready to practice my swing.For kids, the practical session would be the highlight of the session. Once the club is in our hands, we could not resist to swing away. Very so often we would miss the balls, but you could see from our eyes that we are determined to get it right. After a few false starts and having our stance corrected, it's time to hit the mini driving range. Check out my driving skills, not the on the road kind but on the range. Daddy on seeing me having so much fun decided to join in as well. After being corrected on his stance, he actually managed to hit a few decent balls. Maybe he can be my golfing partner in the future. After an hour on the range, we proceed to the greens. It's time for our putting and chipping lessons. The sun was blazing hot, but it not deter us as we are determined to learn as much as we could during this clinic. Although I did not get the ball into the hole, most had landed on the green. Beginner's luck? Need a new idea for playdate? The clinic is available for booking if you have a group of 10 or more. It could be a combination of parents and kids, kids or adults. Personally a parents and kids session is great as it allows bonding between the child and the parent. In addition, parents gets to network while the kids have their share of fun. After a session on chipping , we are ready to move on to putting. Driving gives you the audience but putting is where the cash is. So this lesson is ultra important for future pro golfers. The Putting Lesson was the most rewarding. It is cool to see your ball sink into the hole. We were also brief on the golf etiquette and learn things like never stand on the line of the balls ( shadows included) Overall the clinic experience was a god introduction to golf. The technical aspect may be a little challenging for younger kids to grasp, but we have no problem with the hands on experiences. Daddy likes the fact that golfing made me concentrate during the driving and putting sessions, as it can be quite difficult to make me keep still and focus for most times. I had so much fun that I might just get Daddy to register me for the full course so I can learn more. Maybe just maybe this could be my game and I can turn pro someday. Before the clinic wound up, we were bought to the jungle golf course to give us a feel of what golfing is about. We were amazed by how far the flag pole is compared to our practise course. I look forward to the day I get my first run on the golf course. However before that I would have to learn the basic of the course in order to play in order not to hold play up. For those who would like to play a little golf and not be tied down to the high fees of golf clubs, the Tanglin golf course is a great alternative as its green fees are relatively affordable. Price for youths starts from $17.1 and adults at $34.2 (weekdays for a 6 hole course). Best of all, you do not need a PC to play, so beginners are welcome to try out on this course.More details on the course are available here. Ample parking slots are available on site when we were there on the weekend. It was an enjoyable experience as I had a great time on the course. It was also a good opportunity to spend some me time with Daddy. Thanks my golf kaki Academy for the invitation! The Wacky Duo were invited to attend the golf clinic for the review. No monetary reward is given. However we did receive complimentary carpark parking, caps, tons of fun and a tan. Regardless all opinions are our own.